This book is an essential manual for mental health professionals who work with young anxious children and their parents. Organised into a 10-session parenting-based course, the book provides parents with simple cognitive behavioural techniques for helping their children to manage their worries and fears. This book is an essential manual for mental health professionals who work with young anxious children and their parents. 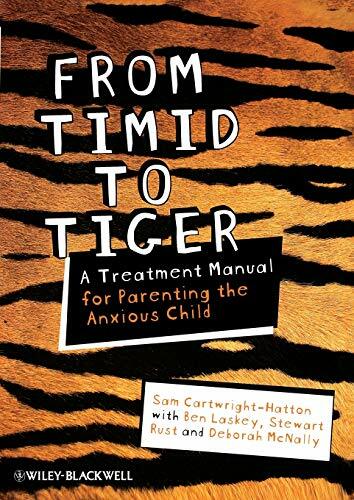 The authors have organised the book into a 10-session course for therapists to use with parents, and each chapter describes a single session of the programme. The course has been evaluated through use with children with a range of primary anxiety disorders, including separation anxiety, social anxiety, generalised anxiety, panic, agoraphobia, and specific phobias. The book allows mental health professionals to provide parents with a calm, warm, clear and reliable parenting style, within which their children can overcome their fears and worries. The course teaches some effective cognitive behavioural techniques for helping children manage their worries and fears. The editors provide an overview of the causes of anxiety in childhood, as well as step-by-step instructions for running the course. The techniques used throughout the book have all been created and tested by the authors in their clinical work, and have a proven track record of success. The result is a book that will allow mental health professionals to train confident parents who know how to instil confidence in their child in order to minimize the effects of anxiety. Sam Cartwright-Hatton is a clinical psychologist and senior lecturer in clinical psychology at the University of Manchester. She previously held an MRC Clinician Scientist Fellowship, during which she developed and trialled a new parenting intervention for young anxious children. She was awarded the British Psychological Society May Davidson Award in 2009 for her research into anxiety disorders of childhood. Ben Laskey is a clinical psychologist who co-ordinates and delivers parenting programmes for the under 8s. He conducts research through the University of Manchester where he is an honorary tutor in Clinical Psychology. Stewart Rust is a consultant clinical psychologist in Neuropsychology at the Royal Manchester Children’s Hospital. He previously delivered parenting groups to families struggling with their children’s behavioural difficulties. Deb McNally is a Clinical Psychologist. She has a particular interest in parenting and cognitive behavioural interventions.